Depending where you are in NSW or Victoria today, this system's influence is impressive. 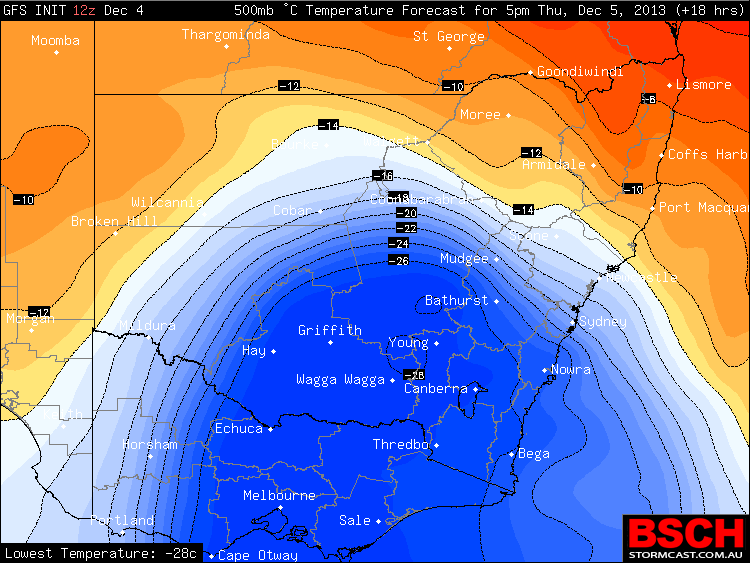 Temperatures at 500hPa over Sydney for instance will drop in just 6 hours from -14C to -24C by 06Z or 5pm this afternoon. This is rather impressive destabilisation. Rain totals down in SE NSW are impressive and there should be snow on the higher peaks of the Snowy Mountains. 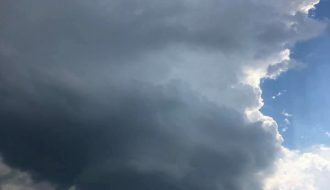 I would not be surprised with such cooling that a few storms will develop but with higher bases due to lack of moisture. 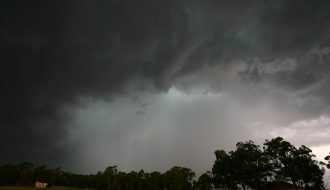 A line of storms did come through to the ranges west of Sydney with a severe thunderstorm warning for wind this afternoon. More storms developed in the cold air mass as the destabilisation became evident. 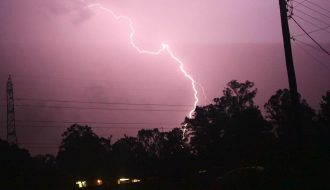 Another storm line moved through the Gippsland region as well. I assume substantial snowfalls are occurring over the Snowy Mountains. this evening and tonight. Mt Hotham – 77 mm. 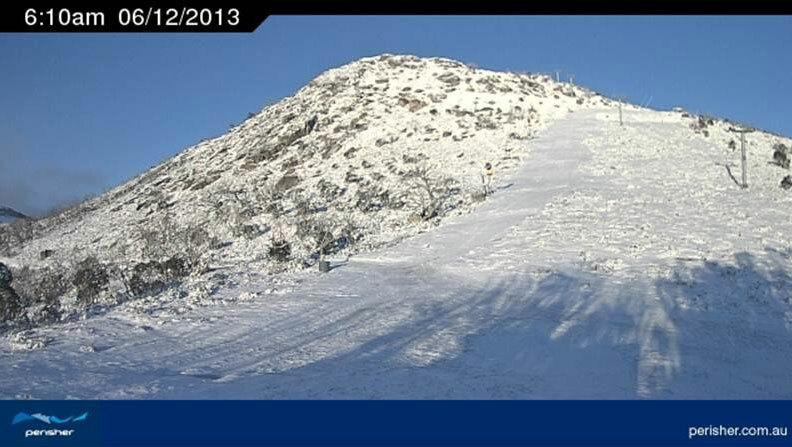 Mt Buller – 71 mm. Falls Creek – 68 mm. Perisher Valley – 65 mm. Harrietville (Vic) – 63 mm. Lake William Hovell (Vic) – 61 mm. 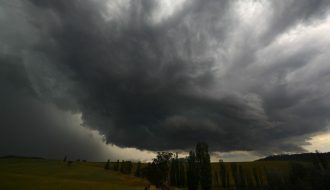 An area to the west including the more rugged country of NE Victoria enjoyed falls ranging from 25 to 49 mm with the best falls including 47 mm at Tatong, 44 mm at Corryong, 42 mm at Broken Weir and Koetong (All in Victoria). The good falls spilled over into southern NSW with the best falls occurring at Deniliquin Airport 46 mm, Booroorban 45 mm and Wakool 37 mm. All places along the southern border of the state received something which broke the dry spell. I have attached the above rainfall map of Victoria showing where the rainfall was concentrated (BOM 5/12/2013). 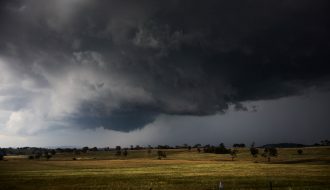 There were storms elsewhere producing rainfall totals but by far, the best falls were concentrated in the NE region of Victoria and the southern border districts of NSW. This did spill over into parts of Gippsland but the falls were not as great. 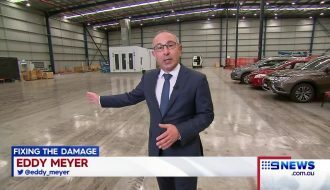 This had a greater impact on Sydney than the morning showers that occurred that brought anywhere from 2 to 8 mm across the city. Camden – A peak wind gust of 106 km/h occurred at 2.44 pm and again at 2.46 pm (Two gusts of this strength occurred). There was another gust of 91 km/h at 2.41 pm. The local weather station for Camden shows average wind gusts of between 59 km/h and 69 km/h from 2.41 pm to 2.46 pm with the peak gusts of 106 km/h occurring during this time. There was another strong gust of 89 km/h at 2.54 pm at this weather station. Penrith – A peak wind gust of 74 km/h occurred at 2.02 pm and another peak gust of 76 km/h occurred at 2.05 pm. Belambi (Illawarra)- A peak wind gust of 76 km/h occurred at 2.25 pm and again at 2.30 pm. Katoomba – The locality saw peak wind gusts to 80 km/h at 1.32 pm and another gust of 82 km/h at 5.01 pm. This did bring down some trees and I noted a tree had fallen down in the unit block complex where I live and I passed a fallen tree at Granville today on the way home. 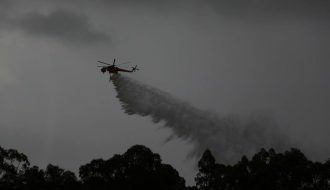 It is understood from reading newspapers that parts of Hornsby were affected by power loss caused by fallen trees and a wind gust of 93 km/h occurred at Badgereys Creek. So while Sydney escaped the heaviest rain, the city was lashed by high winds for a period during the afternoon. Worth a mention. Places that were elevated enough mainly the Snowy Mountains of NSW and the High Country of Victoria was cold enough to experience snow. Not unusual for summer as it does snow here in summer but it is unusual to receive a serious dumping of snow at this time of the year. Cabramurra:- Australias highest town. The minimum temperature fell to minus 0.7C at 6 am 6/12/2013. Thredbo (Crackenback at 1,957 metres in elevation). The minimum temperature fell to minus 4.4C at 5.30 am. There was snow on the ground with the snow cams showing a significant fall on 5/12/13 and overnight. The snow cams were only showing some melting on the lower sopes during the afternoon with plenty of snow cover at elevated areas. The snow cam photo attached for 6/12/2013 for Perisher shows how much snow occurred till 6 am this morning at sunrise at Perisher. Effectively enough to ski on only three weeks from Christmas. It does show how much moisture was available and how cold it was here overnight to produce this scene and many others in the area. The snowy scenes were repeated across NE Victoria down to reasonable levels. 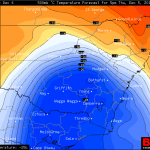 It should also be pointed out that the cold reached the Blue Mountains west of Sydney with minimum temperatures near 3C at Katoomba for 6/12/2013. This is only a brief summary of what occurred but it is a significant weather system for December producing varied weather depending on location. 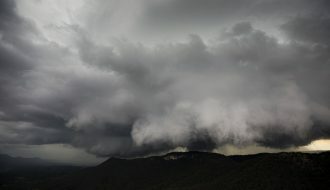 This system did produce thunderstorms in some parts of NSW especially around Griffith (NSW) and near Gunnedah on the NW slopes and plains. The event was generally short lived taking no more than two days to cross the whole of NSW and Victoria.